A little background: The Invasion of Normandy was one of the key victories that helped win the war against the Nazi’s. On June 6, 1944 the Allied forces assaulted the German defenses on the Normandy coast. It was part of Operation Neptune, and the date was given the name D-Day. Of the 160,000 soldiers who landed 10,000 died taking the beach. Once the beach was taken, we had a land route to attack the Germans. History from the American perspective almost always happens in the distance (save for Pearl Harbor, and the Twin Towers). The only battlefields we can visit are from the Revolutionary and Civil Wars. The two Worlds Wars, and all the subsequent conflicts, are known only through stories in writing or video. Something is lost due to the sanitizing effects of the page and screen on the intensity of past events. Only by hearing first hand accounts do I feel the stories change into glimpses of a past reality. I have listened to concentration camp survivors speak with tears in their eyes telling us we must see in person the concentration camps, imploring us to never let those atrocities be repeated. Lindsey’s grandfather, Fritz, told us of his experience of witnessing the liberation of Dachau. He too wanted us to bear witness where the fighting took place, and to understand how terrible the Nazi’s were. Somehow hearing firsthand accounts, and visiting the actual location makes the history more real. Our first day in France we camped by Sword beach, and on the second we walked to Pegasus Bridge (both places named from the WWII Normandy invasion). While walking I thought about how much blood had been spilled, and how many atrocities had taken place underfoot. I had a no idea of what to expect from the local people. Knowing no French, we stumbled through a phrase book, and feeling rather proud of ourselves we arrived at our bus stop. While trying to translate the schedule, a French woman who lived across the street from the bus stop kindly informed us in broken English that there were no more buses. Before we could respond she offered us a ride to get us most of the way to our destination, as long as we were okay riding along with her daughter, to dance class. On the way the woman was encouraging her daughter to do something. After a few moments, with a sheepish look the young girl turned around and said “Hello, my name is Natalie, and I am ten years old”. We realized that we were picked up so her daughter could practice English, more than fair. Everyone we met and talked to seemed friendly and outgoing. People on the street seemed at ease. If there was any after effects of the war and occupation on the French people it was not readily visible. Only a handful of quirks in the masonry of some of the buildings even hint that anything had ever been bombed. The only ruins I could find was the cathedral of St Etienne, a gorgeous gothic church with half broken arches, and stained glass exposed to the elements. Of course I could only get a glimpse from the distance due to a high wall, and locked gates. 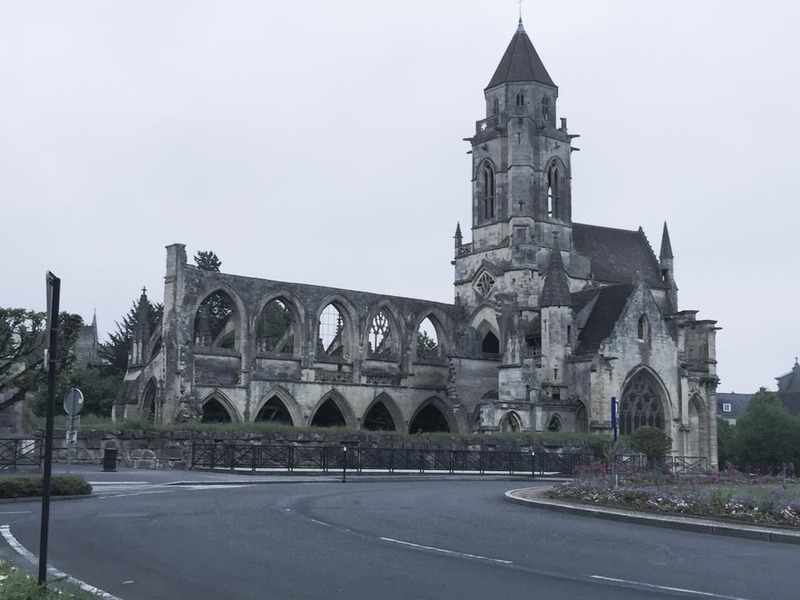 Heightened security measures seemed to be the only hint of France's past occupation. In Caen, and later in Paris high walls, barred windows, and quadruple deadbolts seemed to be common. When I asked a local about this, he said that he didn't know why. He just knew that the French like to feel things are locked and safe. In contrast in the USA a single deadbolt is more than sufficient. Only mansions have brick walls, and only houses in high crime areas have bars on the windows. Maybe it has nothing to do with the World Wars, but it makes sense. On the third day we went to the Caen Memorial. The French perspective of the war was different from what I had learned in history class. The facts were the same, but the emphasis was changed. The museum went into great detail how the France was split in two. One government embraced the Nazi’s, and another supporting the infamous resistance fighters. In contrast to American history, the dropping of the atomic bombs took up a single panel in the whole museum. The last few days in Normandy were spent by Omaha Beach. Along the shore every few hundred yards there is a plaque commemorating the allied forces who landed on that part of the beach, along with sculptures, and memorials. What I was most shocked at was the people on the beach playing, and enjoying themselves. Since arriving I was overwhelmed with a sense of pride in my country, and sadness thinking how easily one of those 10,000 men who died could have been Lindsey’s or my grandfather. Then to see children flying kites, people riding horses and dogs playing in the sand felt wrong to me, I could only see the beach as a somber memorial to those who sacrificed their lives. A moment later I snapped out of it, and decided I was wrong. It was the hope for future peace and freedom the Allied powers fought the Nazi’s. They fought so that future generations could walk safely across what was once a war zone. Perhaps families watching their carefree children play in the sand is the greatest memorial to be seen in Normandy. My mind comes back to the present moment, and once again I am back at the trench leading into the earth. I am surrounded by the thorn bushes, and spiny plants. There is a sense of danger about descending into the trench, not for my physical well being, but my moral well being. In a world where people take selfies at Holocaust Memorials, and damage historical sites to capture a picture I am determined to stay out of the moral gutter. How should I proceed? Should I only photograph the bunker from what would have been the perspective of the Allied soldiers? Should I make photo journalistic documents of what I saw, or try to capture the feeling of the place and allow myself creative license? I decide I will respond to what I find as I feel appropriate. Someone will think I ridiculous and being too cautious, and someone else will think I am being disrespectful. I let my conscience guide me. Crouching down I enter the trench, as evidence by the beer bottles, I am approaching the bunker with very different intentions that previous visitors. Assuming that I will find the bunker sealed off I take my time photographing the trench, and the resulting overgrowth. At trench’s end there is a concrete wall with a small two foot square hole in the bottom. As I shine a light in I find to my disbelief there is an open room on the other side. As if diving into deep water I take a minute to prepare myself, and crawl in. Surprisingly I can stand up inside, there is light streaming in through a few cracks, and a peephole overlooking the cliffs. My focus is complete as I photograph the bunker, I explore ever corner of the concrete rooms. There is an octagonal room I imagine where a gun was once mounted, now it is covered with a concrete slab. There are dead end side rooms, and graffiti scrawled into the walls. Impressions of the boards on used to make the concrete molds are still clearly visible. I am immersed, every corner is investigated, every path is followed. In the end I find four bunkers, stone walls hidden in brambles, and stairs leading to no where. My inner clock fails me, if minutes or days had passed I would believe either. My watch tells me I have been underground for the better part of three hours. Approaching the tent I tell Lindsey I feel like I haven't seen her in days, I am assured that is not the case.- I was completely lost in the work. (Later I found a description of this in Mihaly Csikszentmihalyi’s book Flow: The Psychology of Optimal Experience, in it he would describe how when someone is deeply focused on the task at hand they can enter a state where a person’s sense of time can begin to warp, no drugs needed). It is our last day in Normandy we walk back to the American Cemetery. Repeatedly throughout this trip I keep hearing “Expect Nothing” in the back of my head. We arrive wearing our huge backpacks, and Lindsey wants to visit the museum. Deciding to take turns I wait outside at the memorial watching our bags. Feeling bored I am tethered to the corner of the memorial guarding our bags temporarily stuck, and unable to visit what I came to see. A tour group approaches the center of the American Memorial, normally I walk in the opposite direction, but this time I must stay. A few moments later, a line of American Veterans from various wars forms in front of the monument, and the entire crowd applauds them. One by one the tour group lays flowers at the base of the memorial. Over the course of my life I have been given many reasons to question my country’s integrity, and doubt our legacy in the world. As the ceremony ends, the memorial bells start chiming the American Anthem. No one sings, but the entire crowd begins humming. Joining them we all look out towards the 10,000 marble tombstones in the distance. Never before have I been so overcome with pride in my country. For the first time in my life America moved me to tears.